Launceston Cinema | Launceston Then! The original cinema in Launceston situated in Northgate street. 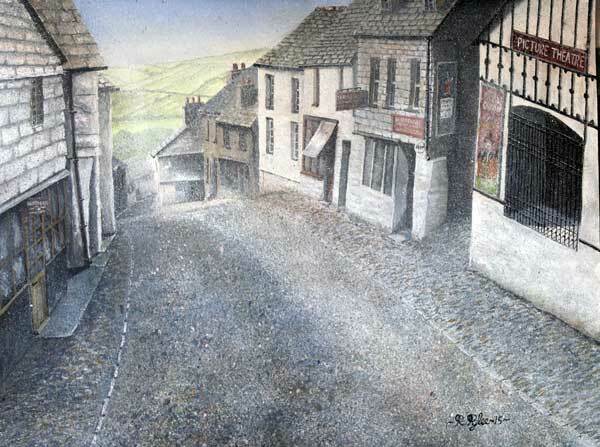 A painting by Roger Pyke. There are those whose memories may refute this, and its accepted that films were shown as sideshow attractions at travelling pleasure fairs, notably in this district, Messrs. Anderton & Rowland. There are others who will claim “Billy Camborne’s Pictures” in a house further down Northgate Street – admission a ha’penny of a jam jar – ante-dated the Picture Palace, but the fact remains that this was Launceston’s first genuine cinema. In those early days at called itself the ‘Launceston Picture Theatre’ and claimed that it presented “The pick of the World’s best animated pictures, with a feature in every programme, travel, drama, comedy, etc. and Two Hours of good, clean entertainment.” Shows were put on nightly at 8. with three performances on Thursdays and Saturdays, at 2.30. 5.30, and 8: admission charges were 1s., 6d., and 3d., with children at 6d., 3d., and 2d., and the whole thing was run by Mr W Ellis Slack, as Managing Director. It operated successfully for many years, with piano accompaniment for the silent epics provided, for part of the time at least, by Mrs May Meagor, still well-remembered until she was displaced in the late Twenties, by the coming of the ‘Phantom Orchestra,’ a grandiose title for the reproduction of gramophone records over loudspeakers. For special attractions Mrs Meagor was ‘augmented by an orchestra consisting of Messrs. F Wicks (violin), A Musk (clarinet), and J (Dublo) Brown (drums). The silent era came to an end on June 6th, 1931, when the Picture Palace closed down for the installation of the “latest British Thompson-Houston sound apparatus to provide The Talkies.” The last silent film to be screened, incidentally was West of Zanzibar, starring Lon Chaney, senior, of course, and the first talking picture, which opened on June 29th, was a British film “Rookery Nook,” with the original London stage players Ralph Lynn and Tom Walls. 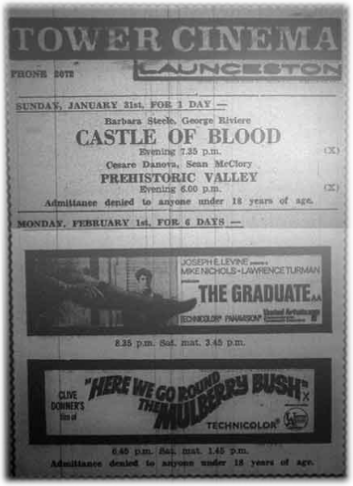 Cinema in Launceston, by Arthur Venning: Cornish & Devon Post 14/12/76. Above Launceston Picture Theatre fire in December 1931. The Tower Cinema in Market street opened in 1935 on what was the original Fire engine house. The first days takings of £32 18s. 6d were donated to the new Hospital fund. The film shown on its opening was ‘D’ye ken John Peel’ starring Stanley Holloway a release from the previous year. “Coming Shortly” was a special attraction: “The Phantom Light,” starring Gordon Harker and Binnie Hale, which had been filmed at Port Gaverne and Boscastle and which many Launcestonians had journeyed down to see in the making. Admission prices went to a top of 1s.9d. (Reserved) on the Balcony, from the previous 1s.6d., and cheapest seats went up from 6d., to 8d. (children under 12 half price). Living memory can tell the story since then; the queues that ranged in orderly fashion up the pavement, around Treleaven’s Corner, and as far as the King’s Arms for the occasions when Gracie Fields and George Formby picture were showing, the packed seats (and gangways) during the Second World War, when the population was swelled by evacuees and thousands of troops, and the battle for Sunday opening, eventually granted after much debate and a public town meeting after the war. In 1974 a lady from Bodmin issued to private summons against the manager of the cinema under the 1824 and 1838 Vagrancy Acts which forbade indecent displays in public places,for showing ‘Last Tango’ in December 1973. The Launceston magistrates dismissed the case on the grounds that a cinema was not a public place within the meaning of those Acts. The Tower Cinema, Market Street, Launceston. Photo courtesy of Ian Smale. By the late 1970’s attendances, with television now dominating, continued their inevitable decline. Tiny houses became tinier, and on February 14th, 1976, Bingo was introduced on some nights to help increase revenues, but by 1983 the cinema ceased showing films and a month later the Bingo sessions ended. Launceston Amateur Dramatic Society showed an interest in taking the building on to convert into a small theatre, but this proposal never got any further than just an interest. The building was subsequently demolished and a modern block of flats called Market Court were built in its place. The irony is that there is now a regular film showing in the refurbished Town hall run by Flics which is proving very successful. Cornish & Devon Post, 10/09/1977: FILMS AT THE TOWER AGAIN. Launceston is to have a cinema again, or at least a part-time one at any rate, write Ian Johnson. Rank Leisure Services, who operated the town’s Tower Cinema as a bingo hall for about 12 months until pulling out last June, yesterday announced that they had leased the building to another operator. Mr Roger Harwood and his father, Stan, have taken out a 21-year lease on the Tower. The Harwoods come from Malmesbury, Wiltshire, where they run the successful Athelstan cinema and bingo hall. Mr Roger Harwood revealed yesterday that there would be bingo on four nights a week at the Tower – Sundays, Mondays, Thursdays and Saturdays – and that films would be shown on the other nights with possibly a matinee on Saturdays.. Eight or nine people will be employed to help with the bingo, and four to run the films. These will be part-time jobs, and in addition there will be a full-time manager. Mr Harwood said he would probably be moving into a more central position so he could supervise both the Malmesbury and Launceston operations. Cornish & Devon Post: 11/04/83: EYES DOWN AT TOWER FOR LAST TIME. Bingo sessions are to end tomorrow [Saturday] because they are no longer economically viable. The closure comes little over a month after the Tower stopped the cinema side of its entertainment. Mr Robertson said the bingo attendance was more than 100 on some nights, but on others it was next to nothing. “It seems to be part of a continual decline in cinema and bingo throughout the country. “ he added. The closure will mean the loss of about eight part-time jobs. But it may now be the end of entertainment from the Tower. Mr Robertson said the building will go on sale on the open market and could possible attract a buyer who might reintroduce cinema or bingo. Cornish & Devon Post, 25/06/83. ARE THE TOWER’S DAYS NUMBERED? Once again the Tower Cinema faces the possibility of closure. Manager Robin Price, who re-opened the Tower for the showing of films on April 28th, says the outcome is entirely in the hands of local people. There are some outstanding films in the pipeline, including the multi-Academy Award winning “Ghandi” and the hilarious “Tootsie” starring Dustin Hoffman. Cornish & Devon Post, 24/09/83. CINEMA MAY BE SOLD – BUT IT’S STAYING. Launceston’s Tower Cinema will definitely stay open despite a slump in audience figures because of the long hot summer. But plans to improve the building depend on the support of the public and the town council. The cinema was leased in April by a London-based film distribution company, which includes, former Launceston College student Robin Price. He revealed this week that his company hope to purchase the freehold of the building from the owner, Mr James Robertson, of West Putford, Holsworthy. The asking price is understood to be £43,000. Said Mr Price; “it will be more commercially viable for us to buy it, but there is a lot of work that needs to be done. We want to renovate the outside of the building and put in new carpets and seats. But, he added, the cinema badly needed the support of the public, “And we need it now – not in three months’ time. We have had bad luck because the hot summer weather has been against us.” Some recent films have boosted audience numbers though –Dark Crystal and Superman 3 proved very popular. Cornish & Devon Post, 05/11/83: NEW MOVE TO BUY CINEMA. A bold attempt to buy Launceston’s Tower Cinema has been set in motion by the town’s amateur dramatic society. LADS members are out to gauge public support for a communal effort to raise the £44,000 asking price. The audience at LADS recent production were handed forms asking if they were willing to pledge donations to help the society buy the cinema. Donations would avoid the burden of high interest payments on loans. LADS committee member, Peter Henness, believes there may be a possibility of grants from various sources if there is enough enthusiasm from for the idea. If LADS took over the cinema it would show films for about three nights a week and be used for theatrical or musical performances by groups based in and out of the town, added Mr Henness. The purchase would answer LADS long-held ambition of finding a permanent home. Two years ago it hoped to move into the old chapel in Tower Street and convert it into a theatre, but that proved impractical. Bordeaux Films, a London-based film distribution company which leases the cinema, said through failing attendances and increased rents, the company was unable to raise the money to buy the freehold. It was felt the building could be used as a youth centre during the day. “Without the council’s help we will not be able to keep the cinema open,” the letter concluded. Members of the council’s environmental services committee had previously rejected the idea of the building being used as a youth centre and had recommended to contact South West Arts for financial help. The committee was told that town councillors at Launceston had also turned down a request from the company for financial help. Cornish & Devon Post, 19/11/83. £600 A WEEK LOSSES CLOSE TOWER CINEMA, by Colin Brent. Lack of public support has killed the survival hopes of Launceston’s Tower Cinema. The closure comes 30 weeks after a young management took over and tried to inject new lifeblood into the ailing cinema. Initial audiences for films such as “E.T.” augured well for the Tower’s future, but recently the numbers have struggled to as little as two at a performance. Tower directors, Robin Price and Rik Prowse, said losses were running at £600 a week which they were having to meet from their own pockets. Lat week the Tower took only £110, nowhere near enough to cover the wages of more than £200 and the weekly rent, said Mr Price. There was praise from Mr Price for the Tower’s staff of three full-timers and five part-timers. The Tower was leased by Mr Price and Mr Prowse. Once their management there ends, the lease will revert to the owner, Mr James Robertson, of West Putford, who has not yet decided what will happen to the building. 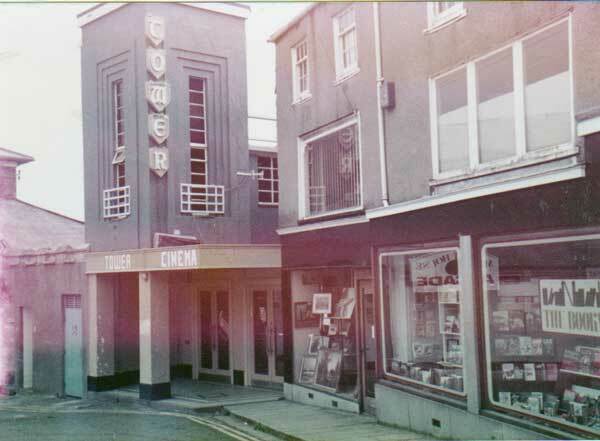 Cornish & Devon Post, 8th February, 1986: Tower Cinema to be demolished. Launceston’s old Tower Cinema is to be demolished to make way for a £1m. development scheme for flats, shops, offices and a car park. The prime development site in Market Street, which includes the Alpha Centre next door, had been bought by a Tavistock firm of property developers at an undisclosed price. Above the Tower Cinema towards the end of its life,with the Alpha Centre next door in 1986. Photo courtesy of Gary Chapman.